Did you ever start reading a story to your students and realize how well it could be used as a mentor text? I'm always on the lookout for mentor texts to use with my first graders for writing personal narratives. There are so many great texts out there, but I often find that some of them are too wordy or advanced for my beginning writers. 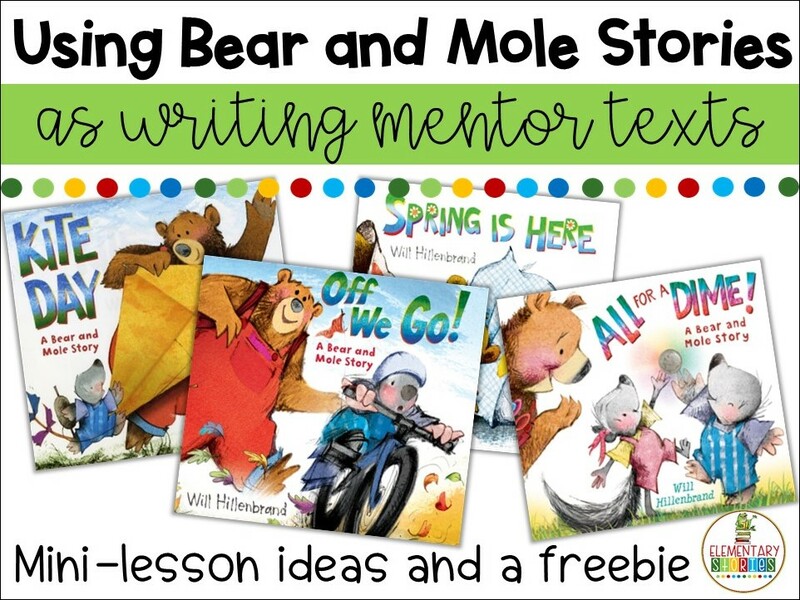 Will Hillenbrand has written a series of books with Bear and Mole as the main characters that are PERFECT for using as mentor texts. The books center around the adventures of Bear and Mole, two friends who are always doing things together. Students can connect to these books because of the simple story elements, beautifully drawn illustrations and easy to read text. Here are some ways you can use these stories as mentor texts for writing personal narratives. It's easy to go back to these stories when you are talking about ideas for personal narratives. In Spring is Here, Mole tries to convince Bear to wake up. Ask your students if they have ever tried to get a friend to do something. In Kite Day, the two friends decide to make and fly a kite - but things do not turn out as they planned. Many students can relate to things not going as they wanted them to. Off we Go is the perfect book for young ones who are still learning or have just learned to ride without training wheels. You can create a chart showing the ideas in each book on one side, and the new ideas they sparked in your students on the other side. This is an easy way for students to write like the author. Will Hillenbrand's books are filled with simple sound effects written in colorful bold type. Talk with your students about the sounds work in each part, then encourage them to find a place in their writing to add sound words like the author. This another technique that works well for beginning writers. In each Bear and Mole story, there is always a part where the author tells what happens in short sentences (always using the past tense - another great skill to practice!) Have students choose a place in their writing where the character is doing something. How could they break it down into smaller parts? 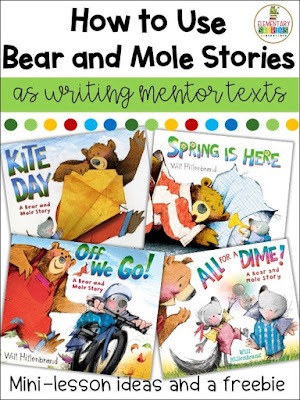 Bear and Mole talk to each other throughout the story, which lends to using this book to teach adding dialogue as a technique. Choose different parts in the story and talk about what the characters said. Students can add dialogue to their stories. This series of book is great for talking about using words other than "said." Go through and list all the words the author uses and you'll see how many different choices there are! You can talk with your students about the meaning of each word and why it fits best in the sentence. Every Bear and Mole story starts with action. "Bear looked at the sky." "Bear picked books off the shelf." "Mole pushed aside some dirt." Have your students put themselves right at the beginning of their story and act out what they are doing. Have a partner describe what is happening. By acting out the action first, students can "see" what they need to write. These simple stories are so rich with ideas for how to write a personal narrative. 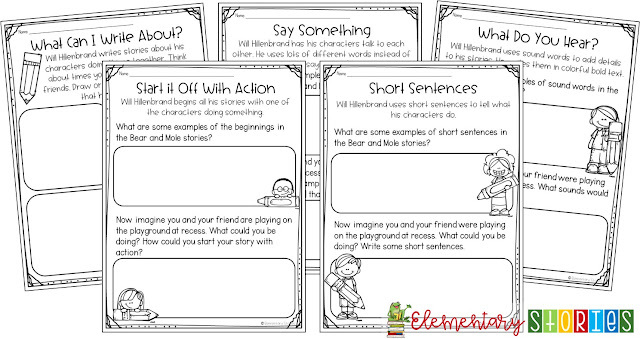 If you're using a workshop approach in your classroom, you can use these ideas for mini-lessons and have students try it out in their own writing. If you need a more structured way for students to practice each of these techniques, I created a practice activity for each idea. You can grab this FREE resource by clicking on the image above. If you'd like more literacy resources focusing on picture books delivered right to your email, you can sign up for my newsletter. Don't stop here! This post was originally part of a great link-up of literacy posts from my friends at The Reading Crew. There are so many more great ideas and freebies for you in our link-up. 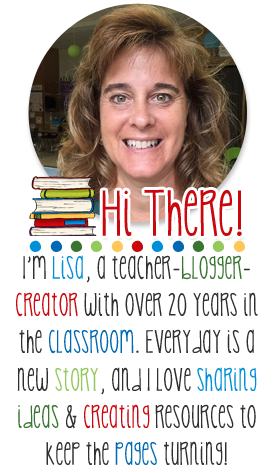 Visit more great literacy bloggers by clicking on a link below. AWESOME freebie! Thank you for sharing your ideas on how to use mentor texts! :-) Much appreciated!